Nike's marketing pitch: Ultralight cushioning for high speed miles. Upper: Single piece engineered mesh. Flywire cord based lacing support. 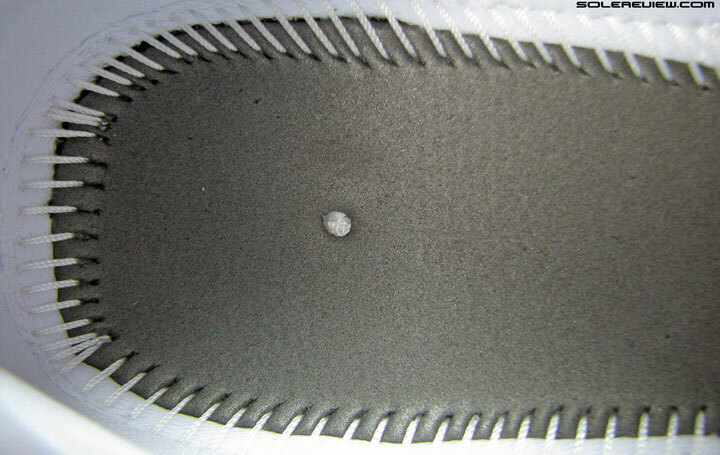 Midsole: Lunarlon foam inserted within a firmer EVA casing. 8 mm heel to toe offset. 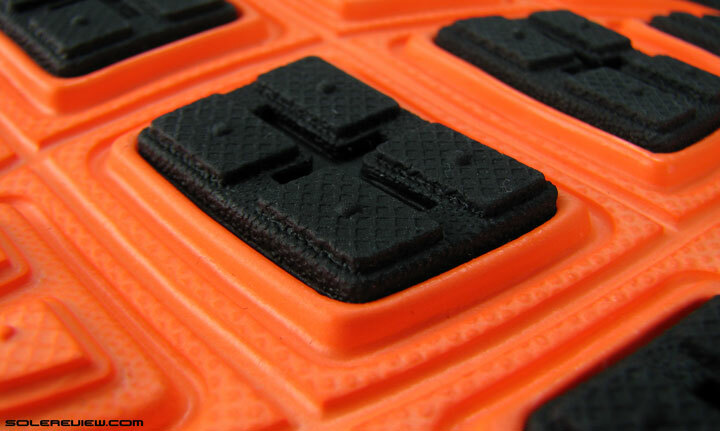 Outsole: Carbon rubber waffle lugs under heel and forefoot. There is this sparsely populated product niche which happens to be the space between racing flats and conventional trainers. It is here where the LunarTempo clicks in perfectly, like a square peg in a square hole. Good for speed runs, carries very little weight and fits roomy except for the toe box. Here’s another Lunar-something fresh out of the oven. What does this one do? 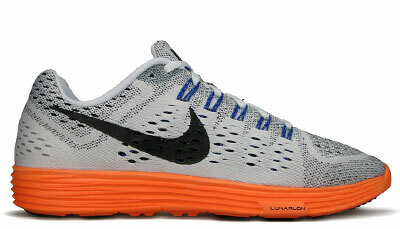 The Nike LunarTempo is an interesting shoe, and a very competent product at that. One which manages to differentiate itself not only against the rest of Nike’s running line, but also within the crowded running marketplace. A shoe which combines a ridiculous level of lightweight, along with excellent ride characteristics. Areas like cushioning, support and transition are blended well together as a cohesive whole. Now close your eyes and think of other models which can do something similar. You’ll probably draw a blank, except for the Lunaracer 3, the shoe on which the Tempo is based. For all practical purposes, view the LunarTempo as a roomy alternative to the existing Lunaracer 3. The other one’s due for an imminent update. The LunarTempo bears a striking resemblance to the identically priced Lunaracer 3, similar to the point of being its doppelgänger. That said, there’s talk that the LR is due for a sweeping refresh in 2016, an event which will drive some design distance between the two. For now, you’d have to treat the LunarTempo has a variant of the Racer 3, and hence both merit a joint discussion during this review; even if you’ve never worn the LR and have no intention of doing so. One thing which massively impressed us about the original Lunaracer (in 2009) was its weight. Back then the Racer was 198 gms/ 6.9 Oz for a US 11, a magical sub 7 Oz weight threshold which many attempt to cross often, but rarely end succeeding. 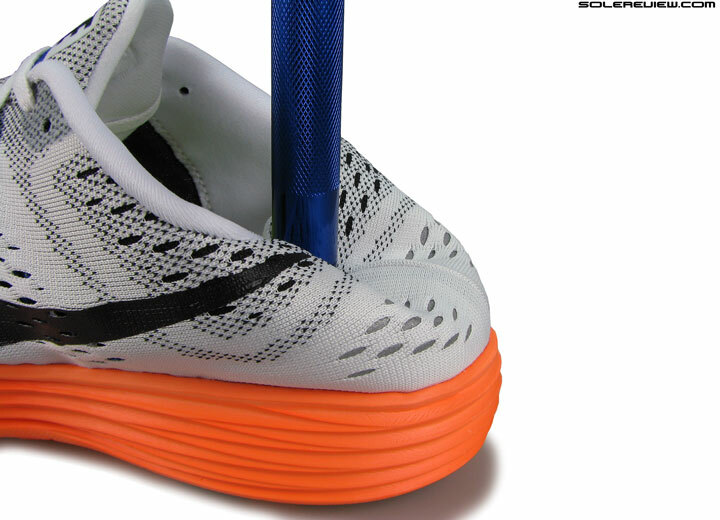 Things haven’t moved much since, and the current Lunaracer 3 uses the same midsole platform of 2009 vintage. Which means there’s also this anachronism which is the Nike+ cavity, making the Racer 3 the last bastion of the once ubiquitous (Nike plus) transmitter pod. …Lunarlon foam insert underneath. Which means that the orange foam is outer casing. 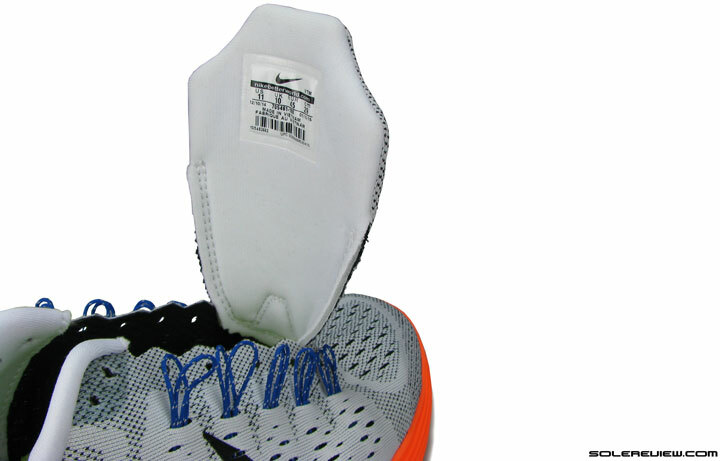 It is this midsole framework that the 2015 Nike LunarTempo is founded on. Speaking of shared design aspects, the Tempo has a Lunarlon foam insert embedded within the EVA casing. 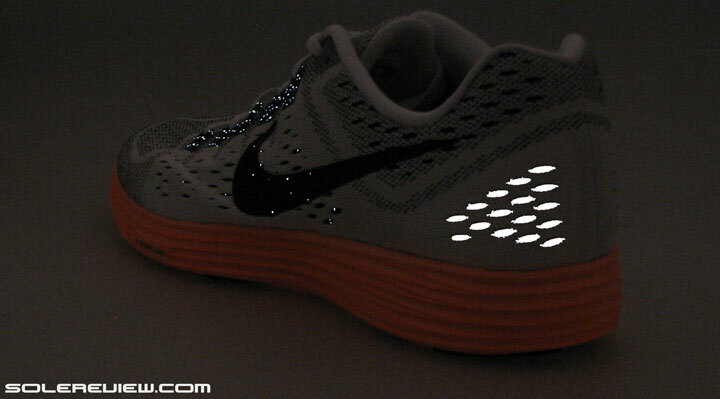 At first glance, it might seem that the entire midsole is made of Lunarlon, like how the LunarLaunch was cobbled up. But the firm ride suggests otherwise, and proof of that is revealed when you cut open the foam lasting. 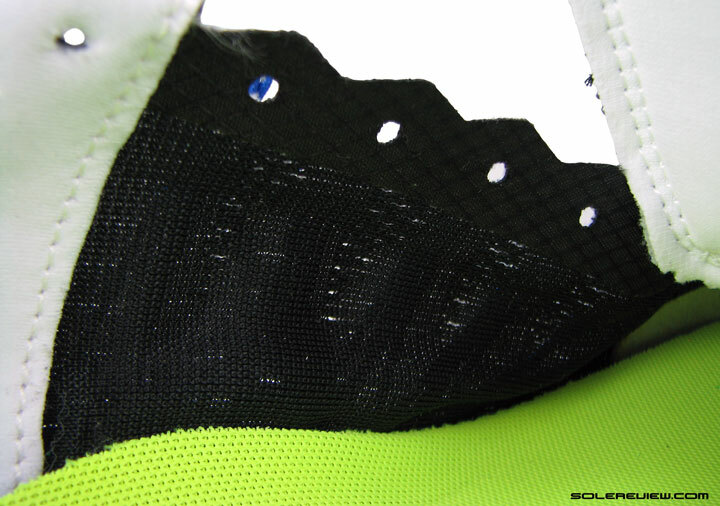 What’s visible beneath is a glimpse of an white Lunarlon foam, similar to how the Lunaracer 3 is stacked up. Yet it rides slightly differently from the Racer, an area which we’ll be happy to detail in due course. 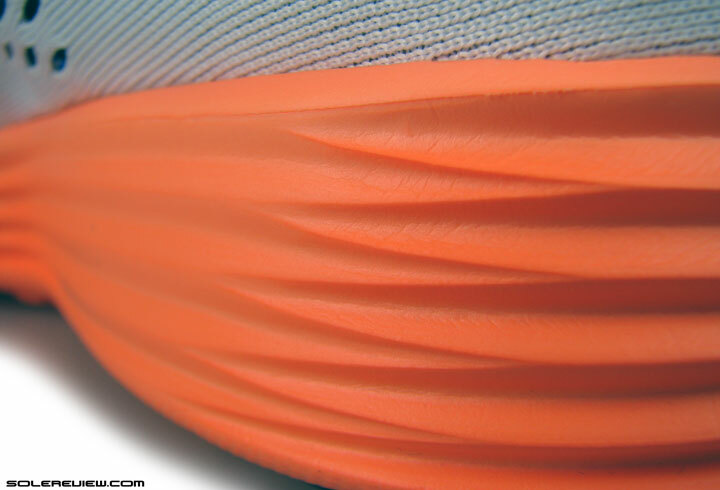 Accordion like looks of the LunarTempo midsole, borrowed from the Lunaracer. Lightweight outsole construction, combination of midsole foam and carbon rubber pieces mounted on top. Midsole sidewalls retain that accordion-eque aesthetic of the LR3 with its sharp, ribbed texture. Switch over to outsole view, and you’ll see a layout derived from the Racer. The sight of wide spaced foam pods or waffle shaped rubber slabs greets you, depending on the area. While both shoes share a full ground contact outsole, the LunarTempo brings in some tweaks to the front, which essentially translates into more rubber coverage than the Racer 3. Outsole tip has been beefed up with a full U-shaped piece and there’re additional bits on lateral forefoot, an area prone to wear and tear for many of us. This material increment over the Racer 3 affects the LunarTempo’s ride behavior on synthetic race tracks – in a good way. Going back to the Lunaracer 3, its upper has an undeniable race focus, which means that it fits snug and well ventilated with a visible degree of stripped-for-action minimalism. The toe bumper is shallow, and the aggressive execution of the Flywire cording results in a higher level of midfoot grip. The LR3 tongue has near-zero foam padding, and though the collar packs some softness inside, it is far from plush. In a way, the LR 3 upper has a lot in common with the Zoom Streak 5 – another lightweight road racing shoe but way different when it comes to overall fit and feel. The upper here is roomy for the most part, comfortable and well ventilated. Five columns of Flywire are concealed, keeping the exterior profile clean. 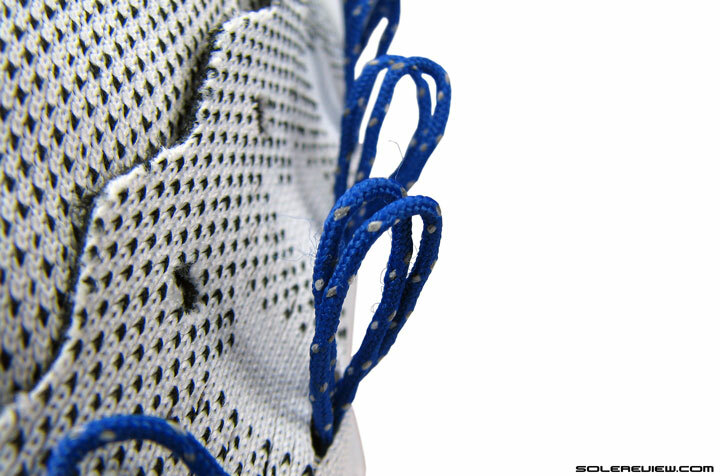 Last row of lacing is outsourced to a reinforced, regular eyelet. You can see the Flywire cords below, don’t you? 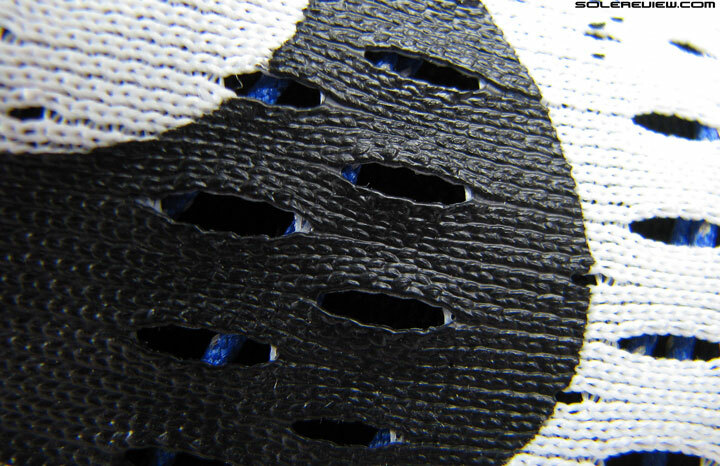 And the texture of the painted Swoosh logo looks like reptilian hide at close range. 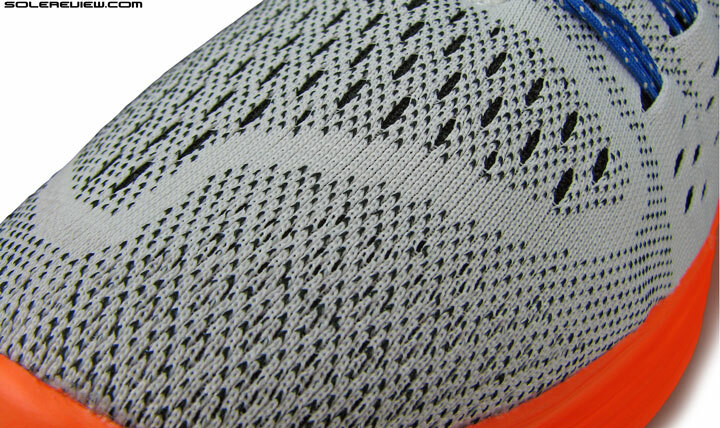 Breathable interior lining acts as a barrier between the Flywire strands and your foot, sock-clad or not. On the LunarTempo, things take on a more relaxed and plusher stance. 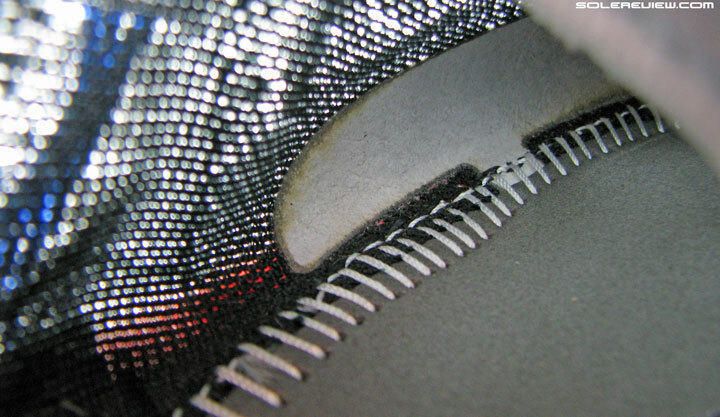 Forefoot has more splay room, a result of both a late lacing start (greater distance between the tip of the shoe and lacing) and tamer application of Flywire cords. Nike’s popular cinching system string up the sides, but with one lesser column than the LR3 ( six rows vs. five) and a stealthy, concealed design which has only the top part of the Flywire visible. 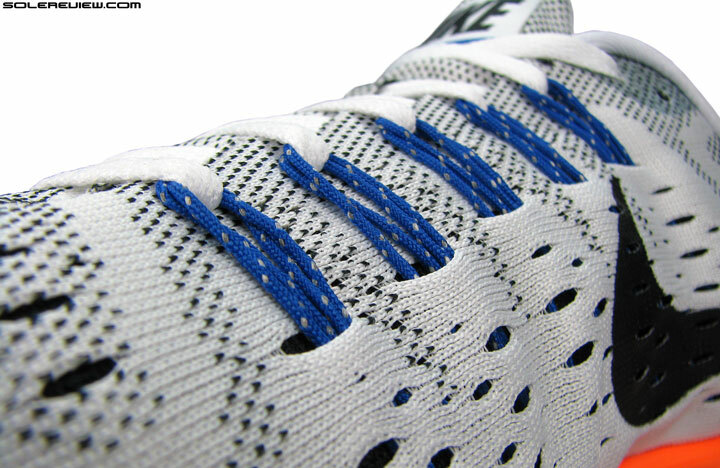 Inside, there’s a fabric lining which separates the foot from the direct pressure of Flywire lockdown. Like the tip of an iceberg, only the top part of Flywire can be seen. What was once new is now familiar. ‘Engineered’ mesh, a buzzword for a single fabric with varying knit structures. Rest of the Flywire cords lie beneath the surface of LunarTempo’s upper, which happens to be this single piece, engineered mesh oft seen on models such as the Structure 18 and Vomero 10. The fabric is open in some areas for stretch and ventilation, densely knit in others for support – you must know the drill by now. On a related note, the Lunaracer 3 fit could be modified to match the Tempo’s relaxed nature – made feasible by opting not to use the Flywire loops. But that’s not an apple to apple comparison and the resulting Flywire sprout would make for an eyesore too. This is the LunarTempo’s tongue. A regular joe as far its design as concerned – look ma, no sleeves! Foam and soft textile lined tongue back, very conventional trainer like. The upper heel stays away from minimalism; adopts the tried and tested fabric and foam mix-n-match. The LunarTempo tongue feels like an organ transplant from the Vomero or Structure 18. 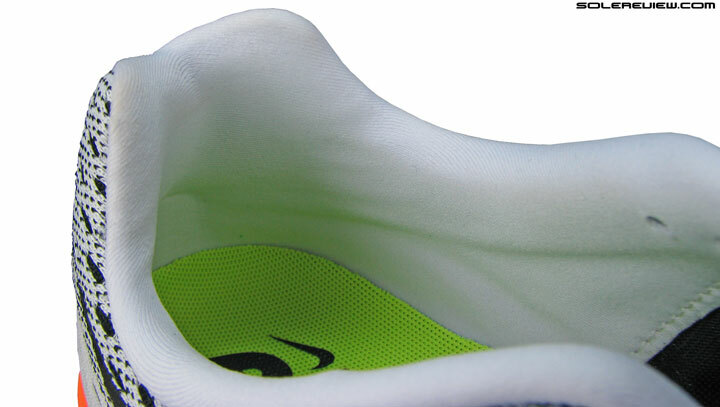 Single unit design with top mesh and bottom lining; foam betwixt the two and the trademark Nike tongue flap design which is prone to moving without a gusset. Heel collar is more ‘traditional’, making good with a soft, foam backed fabric lining. It does not use a full sized internal heel counter, though it might seem like that from the outside. …but fold the upper over, and you’ll discover that it is only partially so. The internal stiffener is a much scaled down version of what usually goes around in these parts. Which means that it is semi-collapsible. Of course, not to the level of contortion a Nike Free possesses – you have to respect the difference. Instead, it depends on a small vertical strip of heel puff – visible when you fold the upper around its edges (see above). While the heel is not super soft, it still ends being somewhat collapsible; a desired design trait for runners trying to avoid a shoe with a rigid heel area. 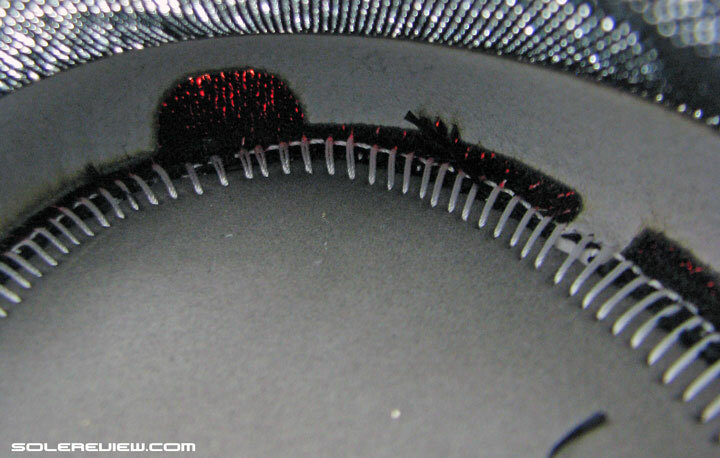 The Flywire threads have reflective bits woven into them. Here’s what you get at night. And the heel is shiny too. Reflectivity isn’t forgotten on the LunarTempo. In fact, there’s plenty of it, as is the case on the Lunaracer 3. The heel underlays are proper shine-brights, and the midfoot Flywire has reflective bits woven into its structure, ditto like the LR. There’s a catch though. The LR3’s exposed Flywire twinkled like tiny stars on a dark night, but the LunarTempo dims things down a bit because most of the Flywire is concealed below the mesh. Much space for forefoot splay, though the toe-box is cramped. With the aforementioned design differences vs. a LR3, the Tempo ends up being much more accommodating with regards to upper fit. The midfoot and heel have adequate hold without that tenacious quality of lockdown, and the forefoot has plenty of room, on par with regular trainers. The tongue isn’t attached to the upper sides, so it ends up sliding laterally. Ok, the tongue loop is reinforced, but sorry, slide happens. 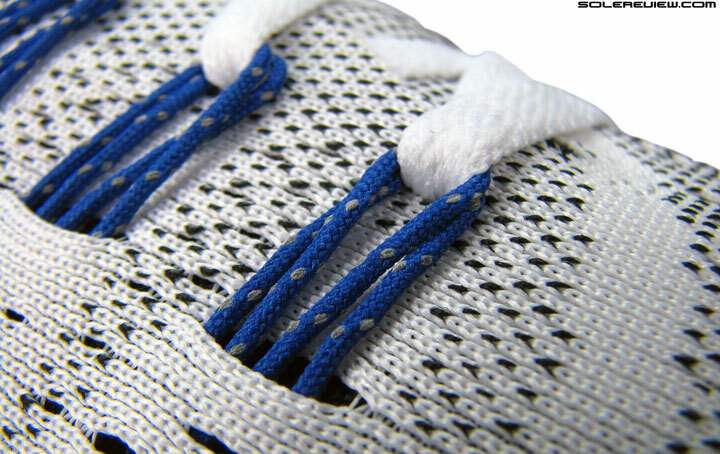 The lacing has a broad spread, so the reinforced tongue loop is helpless in arresting sideways side. From our experience, even a non-gusseted tongue could be made to stay put simply by moving the position of the loop. 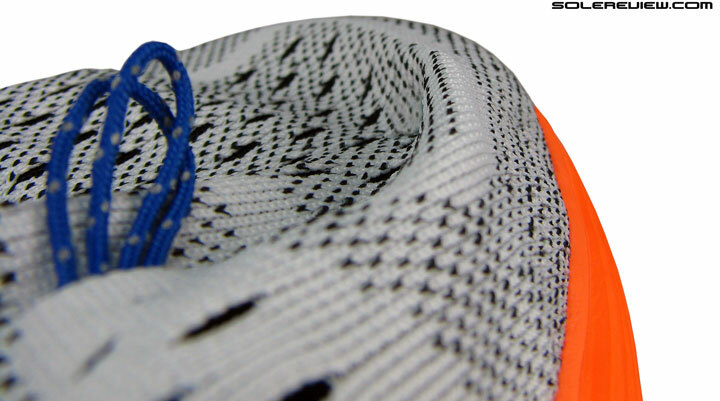 We think this was on the adidas Adios Boost – the laterally biased loop is more effective there than centered. Notice the extreme slopey-ness (not sloppiness) of the LunarTempo’s business end. There’s only one part of the LunarTempo which we’re not a fan of, and that’s the toe-box. The front profile has a prominent slope, and that’s ok – many shoes do, including the Lunaracer 3. 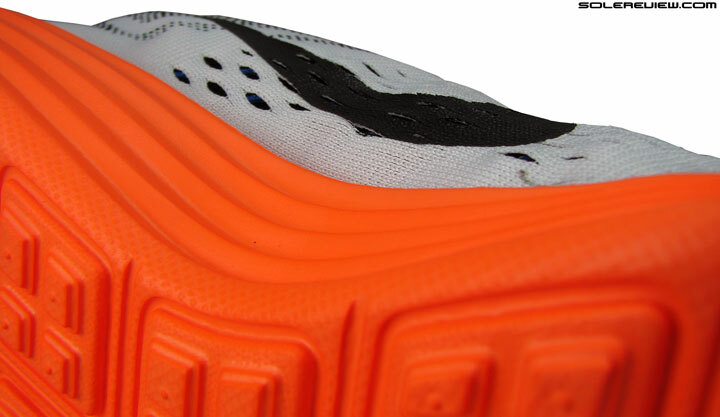 What makes the Tempo’s toe bumper different is its construction. 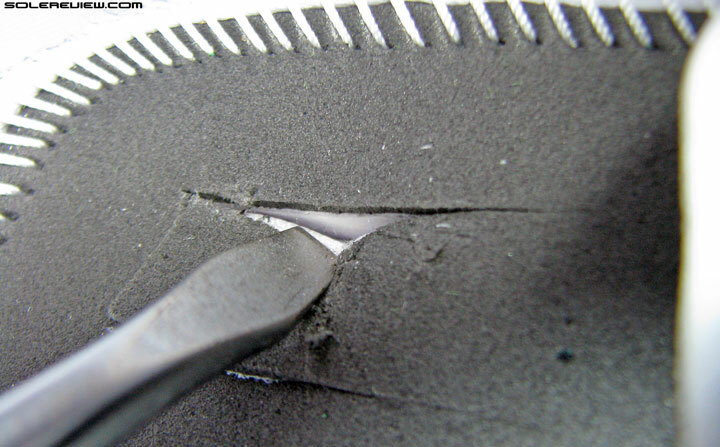 Inside, there is a separate strip of synthetic glued on to the mesh. This is clearly meant to provide structural support and shape to the toe-box, yet it differs in design from other shoes. In many other cases, the entire forefoot has a type of stiffener inside, but that frame lies sandwiched between the upper mesh and lining. This is the puff underlay under the toe-bumper. Same as Lunaracer 3, but behaves differently. Not so on the LunarTempo. Since the toe puff is exposed, it creates a ridge where it ends and the mesh begins. A couple of things happen. The LunarTempo feels a half size smaller than what it actually is – if the toe box were more rounded, it would have felt truer in sizing. And if you half upsize on the LunarTempo – which most will end up doing – the ridge of the toe-puff is felt right over the big toe. The soft upper mesh over the pliable toe-stiffener creates a ridge of sorts. Not irksome, but noticeable. And it is not only the toe-puff which is the cause of it, but rather its design. We say that because the Lunaracer 3 uses an identical construction, but except for the shallow toe box, there is no ridge like effect. It is possible that the contrast of the LunarTempo’s upper material is causing this. The mesh is much softer than the stiffener, whereas on the LR3, there was better consistency. 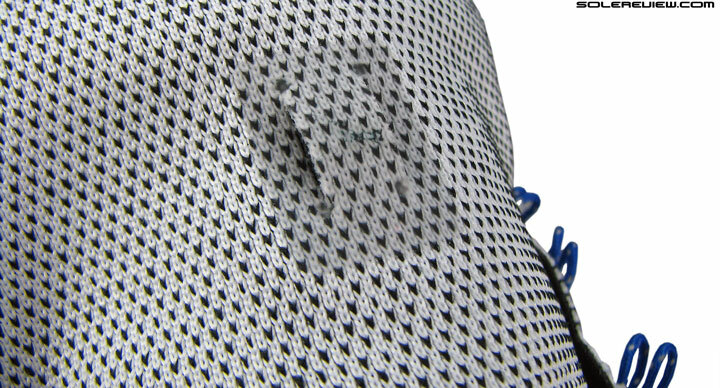 The backing is made of a soft material and does not have the potential to cause blisters, but the sensation can be compared to a leaky faucet. If you fixate on the sound of drops hitting the kitchen sink, you can’t go to sleep. If you ignore it, you’ll barely hear it. This analogy applies to the LunarTempo’s toe box too; the shallow frontend is an irritant only when you train your senses on it. With the exception of the shallow toe-tip, rest of the upper scores high on fit quality. Otherwise the overall upper fit is very comfortable and the spacious interior is a pleasant surprise on what is definitely a shoe meant for faster workouts. Normally these kind of shoes tend to squish down on your foot with all the might the mesh upper and lacing can muster. When we took the LunarTempo for its first outing earlier this month, the first impression felt somewhere between the 2010~11 Lunar Elite and the current gen Lunaracer 3. Although we were expecting it to feel a lot like the LR3 given its shared midsole set-up, it proved to be different in more ways than one. Firmer cushioning than the Lunaracer 3, but more than the Zante, adidas adios and Boston. 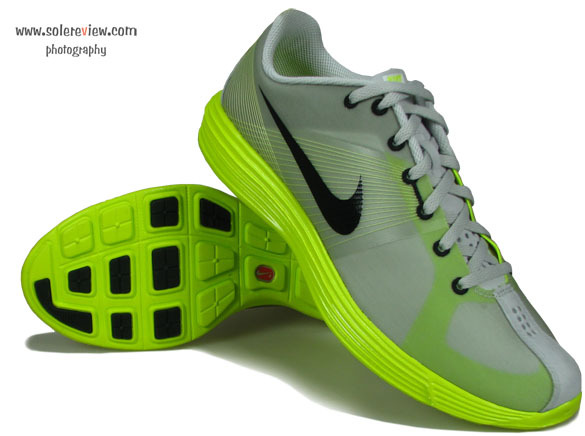 Firstly, the LunarTempo has a firmer ride (in the heel) than the Lunaracer 3. 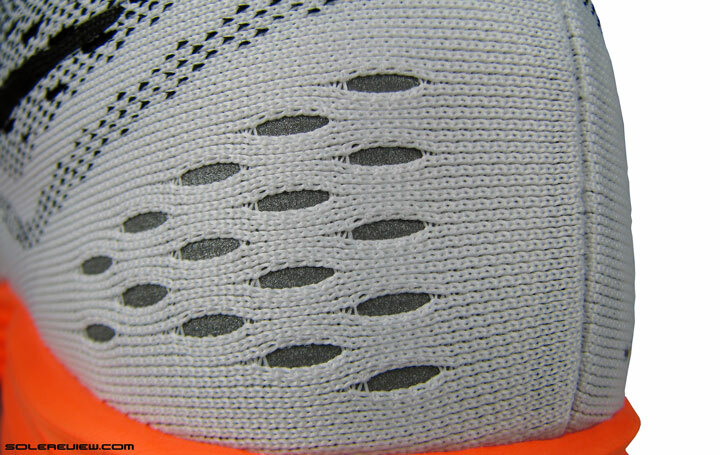 Since the midsole foam density isn’t all that different, we would pin the cause to be the volume of the Lunarlon foam under the heel. We’re assuming for now that the LR3 has more Lunarlon foam inside, hence feels softer. On the other hand, the LunarTempo forefoot comes across as plusher than the LR3, and we see that as the handiwork of a softer Ortholite insole. The LunarTempo has a softy-squishy insole. Removable and molded. 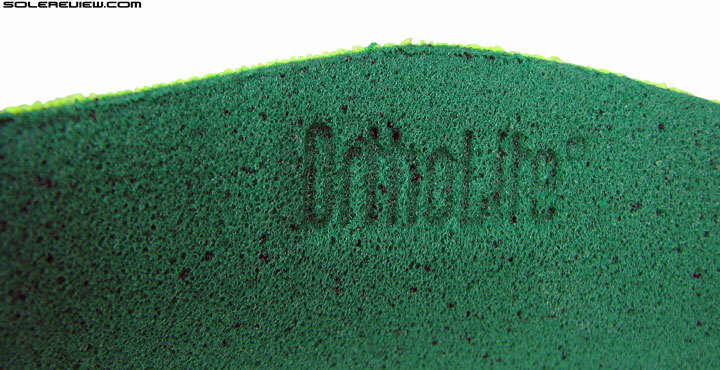 Ortholite is a dominant force as a OEM supplier of footbed. Kinda like what Gore-tex is for waterproof fabrics. Compared to the firmer, compression molded EVA insole of the LR3, the Tempo uses an Ortholite (similar touch and feel of what’s used on Nike Free) footbed. This open cell foam makes for a plusher soft top, and makes the forefoot feel effectively more cushioned than the LR 3. Cushioned, but not soft. There’s a difference between the two – you know that, right? View the LunarTempo in isolation without a LR3 comparison, and what you need to know is that the Tempo is cushioned, but in a slightly firm way. No sink on heel or forefoot strike, and the weight loading is super smooth and economical in its nature. Like most shoes which behave similarly, the reason is the shoe’s use of uniform material across its length. In this case, that consistency is delivered by a heel to toe Lunarlon insert within a firmer EVA surrounding. And this might sound strange, but the Tempo also feels very supportive. The firmer EVA casing makes for a supportive ride. By which we mean not the myriad ways in which a shoe tries to control your foot roll, but in a more simpler sense of that word. Which basically is a derivative of the Tempo’s very neutral behavior – a characteristic achieved by keeping the foot centered. Perfect for all kinds of workouts. Lives up to its name too. And firm cushioning+supportive feel+transition makes the LT (don’t confuse LT with the Streak LT here) the perfect weapon for fast runs. There is plenty of cushioning for going the distance, and unlike typical ‘fast’ shoes, there is plenty of forefoot room, barring the slanted toe box. This combination is further sweetened by the incredible lack of physical bulk(US 11 = 212 gms/7.5 Oz), making the Lunar Tempo one of the lightest shoes available. We’d go as far to say that you can expect some improvement in running timing; many say that shoes make no difference, but trying running in a heavier shoe, and switch to a LT – perhaps you’ll agree to agree. We don’t test all shoes on track, but these gentlemen deserved a duel in their natural surroundings. Since shoes such as the LunarTempo and Racer 3 are typically nice track training tools, we took them both for a spin, and the experience ended up somewhat contrary to our assumption. The assumption was that the firmer forefoot and tighter fit of the Lunaracer 3 would make it a better shoe for speed bursts or intervals on synthetic track. Well, Nike’s old workhorse does feel efficient on tracks, there’s no denying that. But we hadn’t factored for the slightly changed outsole design of the LunarTempo, which has a solid bearing on how the shoes perform on track. See that horseshoe shaped rubber strip around the toe? That makes track intervals much fun on the LT’s. We pointed out the additional outsole rubber on the Tempo. In more precise terms, a full U-shaped tip and a couple of lateral rubber lugs. Now this horseshoe shaped insert has rubber strips on it, with a higher raise of ribs and wider spacing (between them) when compared to the Lunaracer 3. So you when you’re speeding fast on tracks, the tip of outsole mimics a fraction of what you experience on track spikes – they provide last moment grip before those explosive push-offs. 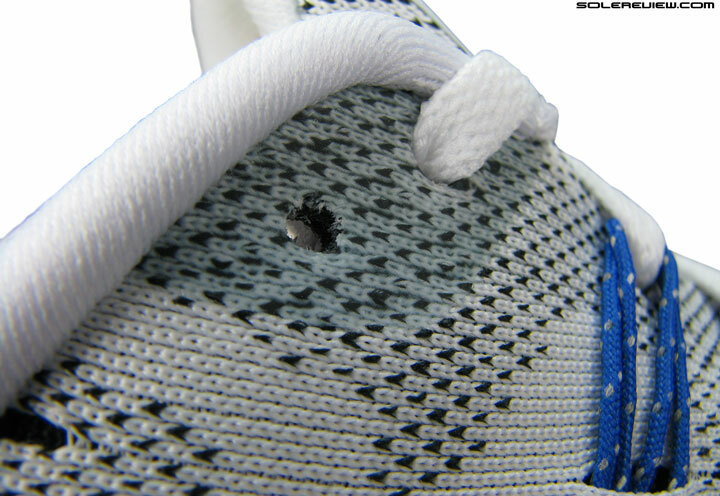 The sensation of rubber tip crunching or scraping the synthetic track surface before the foot takes off feels nice; a toned down equivalent of Christmas tree spikes around the tip of a track shoe. This makes the LunarTempo feel more connected to the ground – especially in the forefoot – while the LR3 felt a little more docile, for lack of a better word. But it doesn’t mean that it’s a home run for the Tempo from a track use perspective. 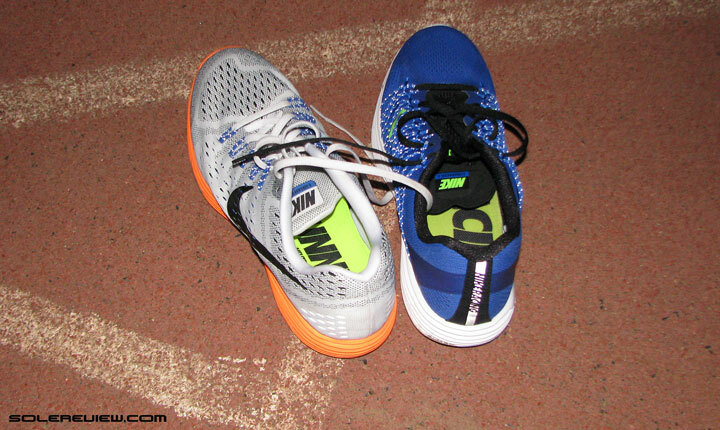 The Lunaracer 3’s firmer forefoot and snugger upper are positives over the Tempo when used in track workouts. It’s a close call, really, can’t say one shoe is better over the other. It might just boil down to subjective likes and dislikes. The LunarTempo has a sense of balance. Firm but cushioned midsole, and topped off with a soft insole. Speedy genes, yet the upper isn’t a vice. As far as road use is concerned, the LunarTempo is an easy shoe to sum up. If you’re out looking for a shoe which marries lightweight, reasonably spacious fit and speed manners, then this is the train stop you should get down at. The LunarTempo is a bit more than a repurposed Lunaracer 3; the shoe holds its own with a new trick or two up its Flywire fastened sleeves. It’s a bridge between the minimalistic levels of pure racing flats and lighter, neutral shoes. It’s 8mm drop isn’t going to bust your Achilles, so the LT is perfect for transitioning down from say, something like a Pegasus, but without the unforgiving ride and fit which usually follows on tempo shoes. There are other models in the fray as far as this category is concerned, but the LT is adequately differentiated, without being necessarily better or worse in comparison. Like the cushioned Fresh Foam Zante, which has a narrower front with slightly less support in its ride. Or the twins of adidas adios and Boston Boost, which arrive packaged with a marginally elevated heel to toe differential and narrower tops. Simply put, the LunarTempo is another successful model from Nike’s 2015 hit machine. Very, very versatile; feels at home on tracks as a training tool as well as fast paced road running, raceday or daily workouts. And in most places, going for less than its $110 advertised retail price. If this isn’t a definition of a sweet deal, what is? Would the outsole be durable for road runs? Slightly lesser than regular shoes, but should go 300 miles easy. Our Lunaracer went that far a few years ago. currently running in Clifton’s and Flyknit Lunar 2s. Looking to change it up a bit and was thinking LT or Zoom Streak. which would you choose? We’d say buy the Streak, since you already have cushioned models. Excellent review as always! Funny you mention the toe box, because it’s exactly why I didn’t buy this shoe and went with the Zante. What’s your opinion of this being a long distance shoe vs something like the Boracay? Really depends on what you’re looking for. We’d side with the LT for long runs, just because it is so light (33% than Boracay) and feels snappier, but with ample cushioning. I’ve basically given up on today’s Nike running shoes, toe-boxes are all too shallow and rub my big toe. Which ones have you tried? Some shoes have rectified this issue of late. Pegasus 31 & Lunar Glide 6 both rubbing on top and hot spots below my big toe. I liked the Pegasus otherwise, but Lunar Glides were a bit too support heavy around my heels and ankle for my liking. Yes, the Peg 31 (32 has this issue too) fits shallow, LG6 fares marginally better. Try shoes with lighter uppers like the Zoom Streak LT 2 and Air Zoom Streak 5. Dumb question but how far does the LT differ from the zoom elite 8? We’re at least a week away from that answer, the ZE8 test runs haven’t started yet. Any news on the ZE 8 review? In progress. Our Pegasus 32 review has a quick comparison and round-up of ZE’s character. I’ve been running in the LT for a couple of months now, and ran a half marathon in July in them. I love them, and just picked up a second pair with the Nike clearance code for when these current ones are toast. I’ve been rotating in the Zoom Elite 8 for a couple of weeks now. I like them, but I don’t think I’d run more than a 10K in them. So, as I train for my next half, I’ve been using the Elite for the 5-mile days, and the LT for the longer runs. Ok, the LunarTempo is very different from the Elite 8. It runs more cushioned, is far lighter and feels faster with our compromising on long haul comfort. We agree with the feedback provided below; the much firmer Elite 8 feels nice till runs upto 10-15k tops, and after that you feel the need for something more cushioned, and this is where the LunarTempo does well very. The Elite 8 has more toe-box and forefoot room, if that matters at all. I just bought the ZE 8, then read this review…darn! However, I also have the possibility to get a Adidas Supernova Glide 7 at 50% discount. Would those two pairs make a decent combo? Also eager to read your opinion on the ZE8, is the review closing up? Can’t say if they will make for a decent combo, as it depends on your personal taste. But let’s put it this way – the Zoom Elite is a firm shoe with a forefoot strike friendly design, while the Glide 7 has an evenly spread cushioning, making it good for rearfoot strikers too. I did not intend to buy a second pair of shoe this soon, but If I too find that the ZE’s are tiresome for longer runs, a pair of cheap Glide 7 seem like a sensible choice. El cheapo Glide 7 Boost should be a good buy. Those are nice shoes! Great review! I’ve been running in Tempo and Lunar Racer 3 for awhile now. I mostly run on the hard packed and sometimes rocky trails out here in AZ. The grip is very good on dry trails- the pods of hard rubber along with the softer mid sole that compresses easier seems to work together well. The Western States 100 male winner was wearing Lunar Racers I believe. As a 55+ masters runner, the cushion along with the 7-8mm drop and light weight does wonders for my old feet and legs! 🙂 I believe the Tempo is a lot better shoe than the Pegasus- a lot lighter and not a rock hard (cardboard) heel. A light shoe can increase you cadence by 5 per min without you even trying, I have found. The Momtrail Fluid Flex 2 has a similar feel to their mid sole foam, but more springy. At 8 oz and low price, it is a very good and flexible road/trail shoe (4mm drop) as a heads up to your readers. Keep up the good work! You guys rock! Appreciate your feedback and insights! Very helpful, Steve. I love the LT. For me it is a do everything shoe, from racing a 5k to track workouts, to 7 mile tempo runs and 18-20 mile long runs. I find that the fit is a tad bit short, but that the flywire in the midfoot keeps my foot from sliding forward so I am not getting the blisters and calluses on the tips of my toes like i do in other shoes. The upper material is also great on the 85* and up days of the summer when my feet tend to sweat a lot. My question is this, how does the fit and ride compare to the Vomero 10? Since I can use the LT for long runs but perhaps want just a touch more support and forefoot cushion, is there a better option than the vomero 10? Appreciate the feedback on the LT’s. The Vomero ’s forefoot has way more splay room than the LT, and the toe-box’s comparatively cavernous. The ride is also very different; the forefoot and heel is more cushioned, though transitions aren’t in the same league. You might also want to try the new Zoom Elite 8. Similar upper fit as the Vomero, and has a responsive forefoot – though not as soft because of the harder midsole material used on the ZE8. The Elite is more supportive than the LT and the V-10. Our review should be up in a few week’s time. Hi. Great review as always. Would like to ask which shoe would be best to be used for running while also doing interval and strength trainings? I would prefer something with boost cushioning cause it seems to be more durable. Shoe type must be stable for lateral trainings and also supportive. We’d suggest either the Glide 7 Boost if you need more cushioning, or the Boston 5 Boost if you need something lower profile and faster. Thanks for the response. How about the cushioning on Speedform Gemini, is it durable or as durable as boost? Which cushioning are durable for long miles? Not exactly sure what the composition of the Gemini’s ‘Charged foam’ is. 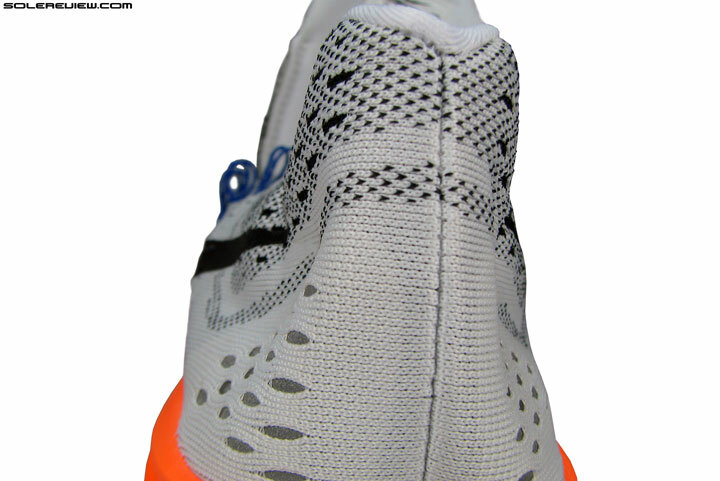 But since adidas Boost is clearly made of Polyurethane, it will retain its cushioning longer. I am using now Adidas Glide Boost 6 as a shoes for training, tempo runs up to 3:40min/km and HM races for about one year. Until now looked that is o.k. Results also growing up slowly. But the last time I started to feel some pain more and more in my ankles and achilles. And I start to think maybe shoes are not correct which I’ve been using or maybe it’s time to change them. I’ve gone with them 1000km. And if to check the sole of my shoes, the outer edges are worn more, that’s can mean I am underpronator a little bit. But Glide Boost 6 are neutral shoes how I now. Maybe that is a problem. But it’s good to ride with them. I tried also Adios Boost 2 for some tempo runs and one HM race, but I’m feeling not so good in these due to less depreciation and hardness. And I cannot say that speed differs from Glide Boost 6. Could you suggest some very good alternative shoes which can be used for easy daily (~4:35-5:00/km), tempo (~3:40-4:00/km) and HM runs?? please do not post the same question multiple times on the website. This is super unproductive for us. Your first comment will be replied to shortly. I’m a 39 yr old avid runner. I train in the Brooks Trancend 1 but do speed work and racing in the Lunartempo. These shoes are unbelievably amazing! I am a mild pronator and have zero issues running in the Lunartempo. I’ve ran up to a half marathon in them. I did try the Pegasus 32 and in just two runs, they gave me a bad case of runners knee. Since going back to the Trancend and Lunartempo, I’ve had no issues. Love the detailed reviews here! I was wondering if there is a way to see what a shoe falls in as far as category. Maybe in the summary, it should list whether a shoe is considered neutral, stability or motion control. Would be super helpful if so. Unless I’m missing something? And thank you for the feedback on the shoes. The Transcend and LT – a diverse yet sensible pairing! If you love the LG, any reason why you want to replace it with something else? The LG7 is here, and while we don’t have any miles on them, the shoe’s midsole is the same as the LG6. The LunarTempo is a great shoe, but won’t feel as supportive as the Lunarglide. If you’re ok with that, then the LT is worth trying! Definitely worth the try. Thanks for the response. I’m currently training for Chicago/NYC marathon, and I am wondering if I should pick the LunarTempo or Free 5.0 for my speed workouts? I have been wearing the Peg 30 for all of my runs, but I want to go the route of having different shoe for different runs. I am going to get a pair just for the long runs, still comparing Vomero 10 and Zoom Odyssey. Easy runs less than 8 miles I will keep wearing my Peg 30 until it wears out, and possibly getting the Peg 32/33. Now for the speed workouts, I’m torn between the LunarTempo vs Free 5.0. I have trailed the LunarTempo for a easy 5 miler and it just didn’t feel “good” for a easy run, maybe it’s meant for faster runs? I had a pair of Free Run+ 2.0 from a few years back and I liked the feel, would the feel be mostly the same with the new Free 5.0? For speed workouts? LunarTempo would be a solid choice. The Vomero 10 does great for long runs, not sure of the Odessey, we’re at least a month away from a full review. The new Free 5.0 feels more minimal and smoother in ride than the Free Run+2. Actually, if you read our 2014 Free review which compares it against the older midsole platform, you’ll get a better sense of what we’re trying to say. And for easy runs, you have the Pegasus 30! I have been wearing the Vomero 10 for my long runs, it felt great. A few things I noticed is that the Vomero 10 is ‘a lot’ of shoe. By this I mean the bottom half of the shoe is significantly heavier than the top half. When I do my long runs, when I get fatigued during the last few miles, I can feel the heel dragging me down. For my runs up to 8-10 miles, I have been running them in the LunarTempo. I was worried it didn’t provide enough support for me, but surprisingly my feet/legs felt fine. Looks like the LunarTempo will be my everyday trainer until I finally replace the Peg 30. I’m looking for advice for a marathon flat. I’m doing Berlin in a month, I run in the Structure and do speedwork and races up to 10k in the T7. Do you think the LunarTempo would be a good marathon racing shoe? I was hoping for a bit more cushion over the marathon than the Lunaracer. 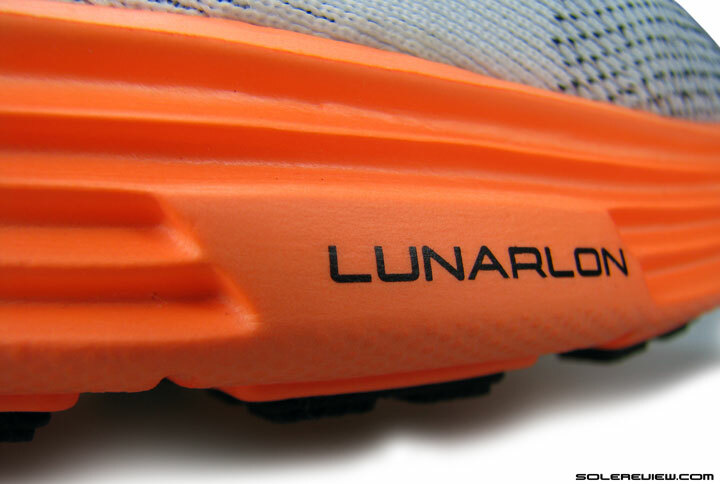 The LunarTempo will do very well for a marathon, but it isn’t all that different in cushioning vs a Lunaracer. Also try the Fresh Foam Zante, and while we haven’t tried the NB 1400 V3, we’ve heard good things about it. Would you say the ones to check out are the Fresh Foam Zante, the LunarTempo and the Adios Boost? Hi, and thanks for an excellent review. I just bought these shoes and I’m experiencing the same toe box issues as you described. I have some room in front of my toes, but the mesh pushes down on my big toe quite a bit. I can’t try them on any runs as I’m thinking about returning them and sizing up 0.5. Is it normal to experience some big toe rub or should I size up? The fit is excellent except from this, so I could probably live with it as long as it doesn’t get worse on a long run. Could it get worse as my feet expand on a long run? Or will the mesh will get stretched a bit as I start using it? Many thanks in advance. For me, I had to size up 0.5. This allowed more toe box height and also more room for my toes to splay during runs. The length of the shoe didn’t bother me since the flywire provided good lockdown of the midfoot and my toes doesn’t bump against the front of the shoe, even during downhills. This only bothered us initially, but got used to the fit. Not that it goes away or anything like that, but did not prove to be an issue – at least in our case. Half Size up only if it is really uncomfortable. I have wide feet so basically I had to go 0.5 size up on the newer Nike offerings with the flymesh upper. I tried the ZE 8, Peg 31/32, LunarTempo, Odyssey, Vomero 10, Structure 18 and all of them I needed to go 0.5 size up. Yes, results will vary based on foot shape. Decided to keep them after all. Can’t wait to try them on a run. (The fact that the half size up was out of stock in my local store made it even easier). I have quite narrow feet so I didn’t have any toe box issues on any of the other Nike’s I tried like LG 7, LE 5, Vomero 10, Peg 32 though. Which shoe would you recommend for long-sprint workouts on track in winter? The interval sprints are between 100-400m. I already locked for the Nike Air Zoom Elite 8 and Lunar Tempo but I think they are probably too soft!? Are there other good shoes? Think we can help better if you can let us know which shoe you’re currently doing your intervals in, and what do you like /don’t like about them. It’s an Asics GT 2000 3, but i’m unsatisfied with it, cause it’s too soft in the part of the foorefoot and it feels wobbly while sprinting fast. I would like to try something really new. My Spikes are already from Nike so I taught maybe the Zoom Elite 8 is something for me. Or not? In that case, the Zoom Elite 8 should suit you well – it has a firm and snappy forefoot; and if you want something lighter, then your second choice of LunarTempo is perfect. Thanks for your awesome support! I’ll go with the ZE 8. SR – thanks for all of the awesome information on your site! I am fairly new to running, but not to physical fitness. Until a month ago I strictly lifted weights. I am now training for a half marathon and cannot decide on a good 1-2 pairs of shoes. I have been looking at the LunarTempo, Vomero 10, and Pegasus 31/32. I was about to order Vomero 10 and Peg 31 until I found the LT. It seems as though the LT is right in between the V10 and Peg 31 in terms of cushioning and distance running. I am 6 foot, 170 lbs. As of now I can run 4 miles in a little slower than 8 min miles. I currently run in the Brooks Pureflow minimalist shoe, but definitely need some more cushioning and support for now. I also tend to run with a midfoot strike, but sometime heelstrike as I fatigue. I tried a pair of Pegasus 32 and like them more than the Brooks, but I’m not sure if they are “the shoe”. I would like one pair of shoes for the lower mileage runs and speed workouts. I would also like another pair for the long runs with ample cushioning. I could be mistaken but it seems like the LT fits both of these requirements. I realize they may not be as firm/responsive as some shoes for speed training, but being a beginner still, I don’t think this will matter as much to me. I have also looked at the Elite Zoom 8 and Lunarglid 6. I have tried all of these on and they feel comfortable in the store, so I am stuck. Any recommendations? Thank you! Thank you for the question, and sorry for the delay in our response! For your lower mileage/speed workouts, try the LunarTempo, Nike Zoom Streak 5, Lunaracer 3 or New Balance 1500 V1. Also heard good things about the NB 1400 V3. The Streak 5 is more speed focused and has lesser cushioning, while the other models have a good mix of speed character mixed with ample cushioning. The LunarTempo does better than the Pegasus 31/32 for the ’speed’ feel, so in our opinion, the order of slow to fast is Vomero-Pegasus-Tempo. Instead of buying two shoes immediately, why don’t you try the LunarTempo first for track and road use, and see how much more cushioning/other performance needs you require for your long and easy runs? You’ll be better informed by doing that. If you absolutely have to get a second shoe for longer runs, then see the Vomero 10 and New Balance 1080 V5. Both have ample cushioning in the forefoot, and then the heel does well when you fall back on a rearfoot strike pattern when fatigued. how many miles you think you can get out of these? roughly? Minimum of 250 miles. More if you’re lighter, optimal form, in colder climate and use a lot of the shoe on synthetic tracks. I have been running in the LTs for about a month, and love the combination of cushion and light weight. I’ve noticed a nice uptick in my tempo runs, and set a PR in the 10k (41:14). I was reserving them for shorter runs, around 10k, but have recently extended them out to runs as long as 20k. After these longer runs, I find that my forefoot is slightly sore, so it makes me wonder if I need something with even more forefoot padding, since I am a relatively bigger runner at 5’9″ and 165 lbs. How would you compare these to the Boston Boost, for a cushioned tempo trainer that could be extended for longer runs in marathon training? A 41.41 10k PR is mighty good pace! The Boston Boost will not be a step up from the LunarTempo in the forefoot cushioning department. For your longer runs, how about the Hoka Clifton? Not significantly heavier than the LunarTempo, and has massive gobs of cushioning. Doesn’t feel as speedy as the Lunartempo, but should not slow you down. Other than that, the Saucony Kinvara 6 comes to mind. There might be other shoes better suited for the purpose, but we’re just basing our recs on our reviewed-so-far list. Great, thanks for the suggestions! I’ll give the Clifton a try, although I had been shying away due to the description of a narrow forefoot. The Kinvara sounds like it’s worth a try as well, since I liked the powergrid cushion in the Ride. I actually went to the store and found the Boston Boost to be a step down in cushioning, as you said. Also, even in a half size up, I found them to be extremely narrow for my feet, and I ended up feeling pressure on the medial side of my arch – much like you described in the Adios Boost review. Just to try another Boost shoe, I gave the Glide Boost a shot, and I loved the cushioning – although it clearly wouldn’t be a fast shoe – and could live with the fit, except the shoe felt like it was slipping and didn’t actually lock down the foot well. I love reading the reviews, keep up the good work! The Clifton 2 is marginally (really minor) more relaxed than the original Clifton, so worth a try. The issue with Clifton’s upper is not so much the overall forefoot or toe-box narrowness, but a pressure point over the base of the small toe. The toe box room is actually not bad vertically. 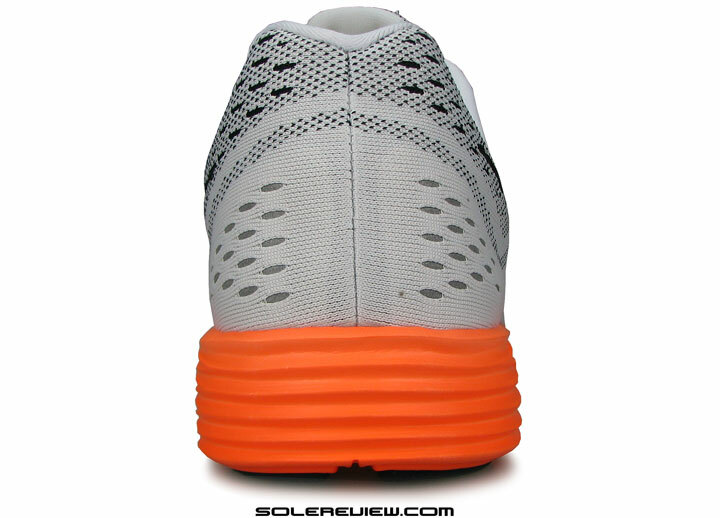 On the same page with your experience of the Glide Boost, the heel depth is a bit lower, and it gives the impression that the upper is lower than what it actually is. Yup, the Clifton surely won’t slow you down! My 10k PR is currently 40:53 with the Clifton 1. I also do speed workouts with the Clifton (1 and 2) and never found they slowed me down (no problems running @ < 3:30 min/km). Also, Sage Canaday ran 2:18 in last year's Boston Marathon with the Clifton 1! Thanks for the feedback! That’s exactly what we thought of the C-1 too. All the comparison with Lunaracer 3 and I still don’t quite clearly understand which one is better of the two. This wasn’t a shoot-out and certainly not intended to be one. They just happen to be different, and the definition of ‘better’ will depend on what you like. We’re the ones just laying the pieces in the open. The profile is Underpronator, weighing 65 kgs and training for a First Full Marathon. Current shoes are Asics Cumulus 16 (for weekday shorter runs) and Adidas Energy Boost 2.0 (for long weekend runs). Cumulus 16 feels bulky, but cushioned amply and still restrictive for longer usage. Energy Boost feels just right. Would like to have some heel cushioning, but less heavy than the current shoes that I have. For a lighter alternative, what could be a shoe for the above profile..
We only get Nike, Adidas, Asics and Skechers (though I have a general bias against it) in our country. We’d say, get the Lunaracer 3 or the adidas Adios 2 Boost. I’d like to order Nike Lunar tempo because I have not possibility to try them locally. What is the size of LT to compare with Vomero 10? Should I choose same size or to go 0,5 size up? P.S. Thank you for great reviews! You’ll need to buy a half size larger than the Vomero. For example, if your size in the Vomero is US 9, then it should be safe to buy a 9.5 in the Tempo to get the closest toe box space. Hello, love the site and is always my go to before trying shoes in store. I’m currently running on Ride 7. Looking to add a lighter / quicker pair into rotation. I’m a heel striker and love the sound of the Lunar Tempos. Just not a Nike fan. Can you suggest an alternative with the same ride dynamics. You could always try the adidas Adios 2 Boost, New Balance 1500 V1, Fresh Foam Zante or the Skechers GoMeb Speed 3. They ride differently from the LunarTempo, but have their own merits in this weight/intended use category. Thanks for the super quick reply. The 1500v1 look spot on. Had dismissed NB after my wear challenges on the Boracy. However, willing to give the brand another go as these will be used in rotation for shorter (sub HM) distances and speed / tempo runs. I’ve taken the plunge and purchased a pair of On Runnings Cloudsurfer’s for longer distances. Felt amazing on the treadmill and have read and heard so many great things about them. I know your policy / budget means you stick with more recognised brands. But would love to hear your view, as your one of the few sites that I really trust. The 1500 V1 ride very differently from the Boracay, and in a good way when it comes to speed. So worth a try. People say good things about the 1400 V3 too, but we haven’t had the opportunity to test them. Thank you for the feedback on the Cloudsurfer. We’d love to diversify our review range, but budget gets in the way, and we don’t accept free shoes anymore (the Elite 8 was probably the last). Would certainly cover Altra/ON/Newtons/Pearl if circumstances change. Thank you for the kind words! Hi and thanks for the review. I am 5′ 9″ and 154 lbs. Im planning on running Chicago marathon on 02 hrs 55 mins. Im looking for some shoes for the marathon that can offer me good protection but are lightweight. I have a 10k PB of 36:54 and a half marathon PB of 01:23 both using Adidas Adios Boost 2, i use Nike Pegasus 32 for training and long runs. Im afraid the Adios wont offer enough protection for the marathon. I dont know if the LT are a good option for what im looking for or if i stick with the Adidas Adios. Also, what other models could be a good option. Do you actually sense any discomfort after the 10 k/half or are you simply apprehensive that the cushioning isn’t enough? You can experiment with the LunarTempo or Lunaracer 3 if you need more cushioning, but if there is actually nothing wrong with the adios, we’d suggest that you stick to them. And your PB’s are pretty awesome, by the way. I got some achilles tendon problems after my last half marathon three weeks ago due to a calf contracture, thats why im afraid. That was my second half marathon using the Adios with the first one having no problems at all. Im actually fully recovered. Appreciate the reply. Can’t say with certainty whether it was the shoe to blame (since you ran the first HM without issues), could be something else. If you want to experiment, the Nike LunarTempo is a great option. Hi, if you don´t stick with the Adios Boost or Lunartempo you may also consider the NB Vazee Pace. I think it is a very capable Marathonracer for your goal time. A bit lighter than the Adios Boost and offers more support. The ride is firm and responsive with good transition quality (quick and fluid), but overall more protective than the Adios Boost. Thanks for the great reviews! I got the Nike Pegasus 31 based on your review and have been loving it. I’m interested in getting a shoe like the LunarTempo for speed runs, but the challenge I’m facing is that I have extremely wide feet — I got the Pegasus in a 4E, and it looks like the LunarTempo only comes in D. Any recommendations? There is a potential solution. Go to the store, try the LunarTempo without threading the lace through the first two Flywire loops. If that works, then bring the LT home, and snip the Flywire cords #1 and #2 at their base inside. This will open up space in the front without negatively affecting midfoot fit or looks. Your site ist awesome! Good to see such attention do detail! Although I don`t have the Lunartempo, the same shallow toe box of the Nike Terra Kiger 3 (even shallower with my orthotics) puts pressure on both of my big toes. I normaly run 10 – 12 km in this shoes. After a 27 km trailrun yesterday both big toes are aching, so that I cannot run today. It is clear that is the shallow toe box, because when I lift my thumb against the mesh I feel, that this motion (or the lack of it) is responsible for the pain. Otherwise the Nike Kiger 3 are the perfect trail shoe for me. Light, good foot protection because of the Zoom units in fore- and backfoot. It`s hard to find something comparable. My foot length is 26,5 cm (with socks) and I have very wide feet and a high arch. My current Kiger 3 are Euro Size 43 (27,5 cm). Would sizing up to size 44 (28 cm) result in a higher toe box, considering that all Nikes get bigger in the same way? The problem with going size up is that your widest part of the foot (forefoot) gets pushed backwards into a narrower section of the shoe (midfoot). So in your case – and you say that you have very wide feet – the change in foot position inside the upper might present problems of its own. In short, yes, you’ll get more toe box space, but that might come at the cost of something else. How does the cushioning (softness and amount) compare to the Asics 33-FA? Thanks! The 33FA is much softer than the Tempo, which is comparatively firmer from toe to heel, and fits narrower than the FA. the races, I´m considering to buy a pair of Lunartempos. I probably have a similar problem like Chris below. I wondered when getting my Pegs I must to go size up to 9.5 however normally I used to wear everyday shoes in US sizes 8 or 8.5. But the Pegs put pressure on both of my big toes even in size 9, and I didn´t want to risk blue nails after a good marathon. So my question is: Do you think, that the LT-s could be fitting in similar perfect way in size 9.5, like the Pegs, or should I go a 0,5 size down?. The Pegs should be more plushier from the inside… (Only for accuracy, I tried on also a pair of Zoom Elite 8 today, and they were perfect in size 8.5, but I want smthing lighter.) I seek for a light, not too loose racing shoe, with enough cushioning, for example I have doubts about the Boston Boost. Maybe needlessly? (Altough hard forefoot striker, very satisfied with Pegs, weigh 156 lbs). issue is that I found LTs between the sizes 8.5-9.5 regarding my location (East-Europe) only in webshops, every local stores were out of those sizes. Sorry for the long wailing, but I couldn´t write it down more briefly. I will really appreciate your answer! Hi, in terms of your fit requirements i would throw in an alternative. Out of the Lunartempo and the Boston Boost the NB Vazee Pace has the roomiest forefoot within a normal snug fit. Weight is like the Lunartempo and lighter than the Boston Boost. The cushion is equal to the mentioned ones, but also has the firmest feeling. Those firm, but cushioned for (fast) long miles shoes. So, if you want a soft feeling under your feet you might stay away from the Vazee Pace. Otherwise, it feels best for forefoot/midfoot strikers (6 mm drop) with a good transition quality and it is very responsive (for me the biggest selling point of the shoe). Out of the three the Vazee Pace is for me the closest one to a pure uptempo workout/race shoe, if you don´t want to go with a full racing flat (for marathon it is basically a racing flat, those more on the protective side). The LunarTempo’s toe-box is even more shallower than the Pegasus 31, and its puts slightly more pressure on the big toe. To bring the LT toe box pressure to the same level as the Pegasus 31, you’d need to further half size up – or at the very least, stick to a 9.5. Boston Boost is good, but that shoe does not have any advantage over the LT. Ditsch has recommended the Vazee Pace in the comment below; while we haven’t tested them yet, it could be worth checking them out, we’ve heard great things about that shoe. Hi guys! Many thanks for the advices (special to Ditsch for recommendation). Although I don´t used to have a shoe-collection, the Vazee Pace tends to become my next racer. They are more than fine, worth your review. Awesome review and very detailed as well! I’m looking for a new half marathon/marathon shoe. I’m debating whether i should get this shoe or the zoom streak 5. They do not sell the zoom streak 5 at any stores where I live so i will have to get it online. I have both the LunarMontreal and Lunaracer 3. I consider the montreals to be one of my favorite running shoes and it hasn’t given me any problems; i actually ran my first marathon in my worn down montreals. 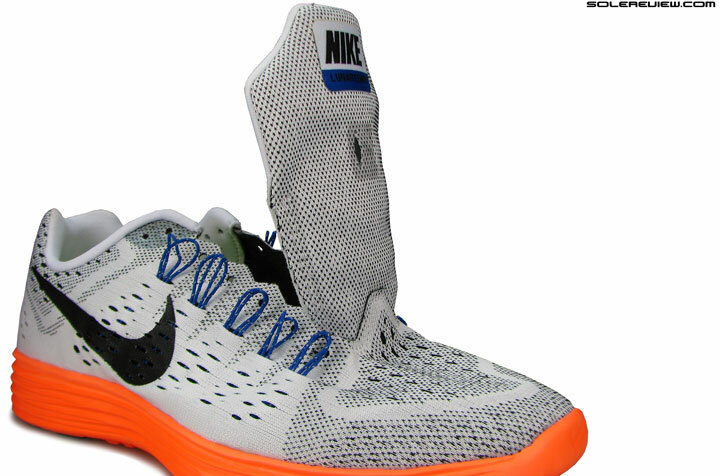 Then i decided to get the Lunaracer 3…..for some reason the shoe felt different. I thought it would be the same ride since the montreals are based on the lunaracer line. However i started to get plantar pain whenever i run past 4 miles in the LR3. And i ditched the shoe after 75 or so miles. I don’t know if it’s a cushioning problem, fit, or if i just got a defected shoe. I want to give this shoe another shot, but i’m afraid i might experience the same problem as the LR3. On the side note, i’ve been wanting to try the streak 5 for a while. Hope to hear you soon! If you already have the Lunar Montreal and the LR3, worth giving the Streak 5 a try -the LunarTempo shares a lot in common with the LR3. This will also bring some diversity into your shoe rotation, as it rides differently than the FL Racer, HG and 4.0. Thank you for the speedy reply! Do you happen to know if Nike every plans on bringing back the LunarMontreal, or is it a one time thing? I found the cushioning on the LR3 too plush after running in the lunarmontreal. Have no idea about the LunarMontreal re-launch! Haven’t seen them in the past couple of years. Hi! I’m looking for a more cushioned (mostly on the forefoot) and more durable (the forefoot LunarTempo rubbers wear out after 200 miles) durable version of the LunarTempos (a bit of extra weight is fine). My sense is that at the other end of the spectrum would be the Cliftons (though not for durability). Anything in between wig decent durability? Maybe the Boracays? Thanks so much for the detailed reviews! The Clifton has a massive amount of forefoot cushioning, but as you pointed out, durability isn’t exactly its strongest suit. 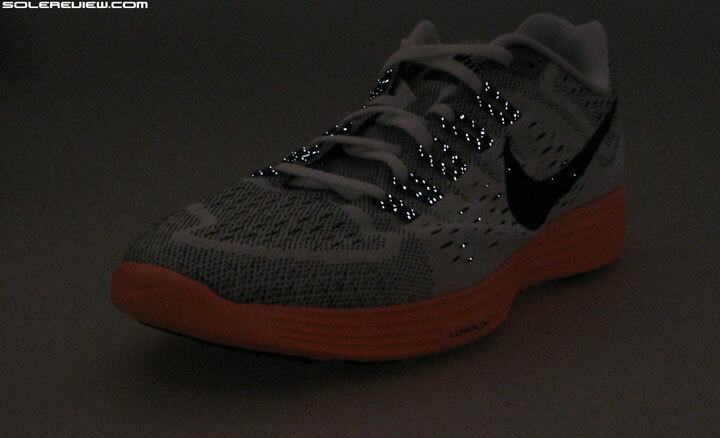 We’re thinking the Flyknit Lunar 3 instead. Reasonably lightweight, and way more durable under the forefoot, with plenty of forefoot cushioning too. Hi, I am looking for a new pair of running shoes and would really appreciate some help. I am 16yrs, 5’7, and 115lbs, I don’t have any pronation, my current shoe is the Nike LunarGlide 7. After running 200 miles on them I haven’t enjoyed them very much because they felt too firm and not as plush as my past shoes (Flynit Lunar 2). The shoes I am deciding between are the Vomero 10, Flynit Lunar 3, and LunarTempo. Considering that I like a plush feel in shoes that can run 40mi/week including intense speed workouts, which would be best for me? Try either the Flyknit Lunar 3 or the Vomero 10. We have a feeling you’ll take to the Flyknit Lunar 3. Thanks for the quick reply I will probably listen to you, but out of curiousity why rule out the LunarTempos so easy? Thanks again! Because you found the LG7 a bit firm – which the LT is too – and you liked the Flyknit Lunar 2! If you need forefoot and heel cushioning with lesser weight, then the Flyknit Lunar 3 it is. I am beginner runner and now i’m using adidas duramo 6 for my training and my shoes size is 9. 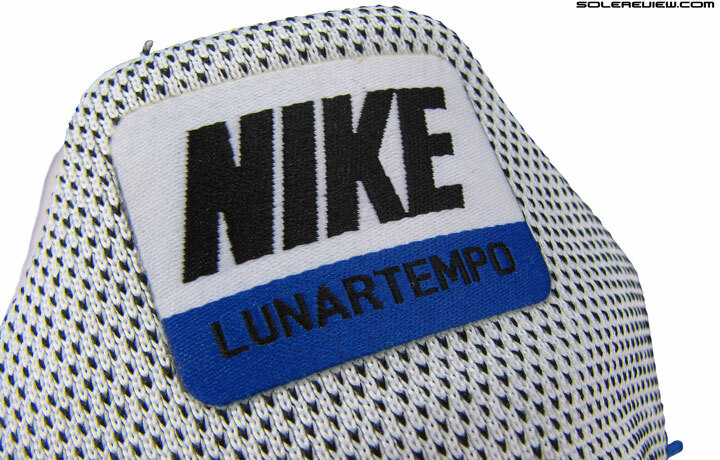 I’m interested to buy Lunar Tempo and can u advice me is LT has similar fitting with duramo 6. Not sure, Zamanhuri. We haven’t tried the Duramo 6. I read about the “abnormal” toe bumper and stuff but so is it bad if my toe brushes on the toe bumber while I walk? It didn’t really hurt but it just felt a bit awkward. Should I size up? I’m not sure if its a matter of a small shoe (hitting the end when I walk) or just a design thing. I can see how the exposed toe bumber makes it seem smaller. I have a pair of these shoes. I wear a half size up in them(11.5 instead of my normal 11). It just feels awkward as you said – one gets used to it. We did not feel the need to half upsize. My toe brush the toe bumper too which is okay but if I run up to a half marathon, the repeated toe hitting the bumper will be very bad and I my toes finger will really hurt by then. It hurts like your toe finger got pinch really hard that the pain stayed in the nails. In fact I got a black toenail on my longest toe finger. For me (I wear the biggest LT size), its ok for short to medium runs but longer runs will hurt your toes really bad. wow! your site is encyclopedia of running shoes. I have question about my next shoe selection. History goes as, I had ASICS Gel-Flux for last year, its outer corner was badly worn after 250 miles. Other parts of sole worn out normally, so probably something to do with my running form. And I had no injuries. I run (alternate days, 6 miles avg) on roads with lot of short and steep uphill and downhill. I am kind of flat footed. I narrowed down to Pegasus 31, Lunar Tempo, Triumph ISO. Any suggestions from you? We had no experience with the Gel Flux, so no idea on how they compare with some of the other shoes you’ve mentioned. But if it is outsole durability you need, look no further than the Pegasus 31. Thanks! I will go for Pegasus 31 then! From your review I see that they provide nice heel cushioning too. I am a beginner when it comes to running. I experience a lot of pain while running and was trying to find the right shoe to help that. I am fairly flat footed and overpronate, I was wondering what shoe you would recommend for these issues? Chris, shoes might not be the cause for the pain, and neither can they necessarily relieve it. Unless there are some actual issues with your form. In any case, best to see a physio or podiatrist and get a professional opinion. Hi! I haven’t do any training and running for quite some time since I m focusing on yoga, and I m ready to start again. The reason I stopped for a moment is because I kinda use the wrong shoes and hurt my legs. I bought Pegasus 32 and I loved it, for me it is comfortable and well cushioned (thanks to your review!) . I have been looking for a shoes just for running, last time I ran mostly on treadmill since it always rain here and I m 106lbs, 5’2. I m considering either Flyknit Lunaracer+3 and Lunar Tempo, I havent tried these two yet because they are sold out at every place I go, I have tried LunarGlide 7 and I think its a bit firm which I dont like. I tried Vomero 10, I only remember it is comfortable but couldnt find my size. Between Flyknit Vomero 10, Lunaracer+3 and Lunar Tempo, which one will provide better cushioning on forefoot and midfoot and better durability? Get the Vomero 10. 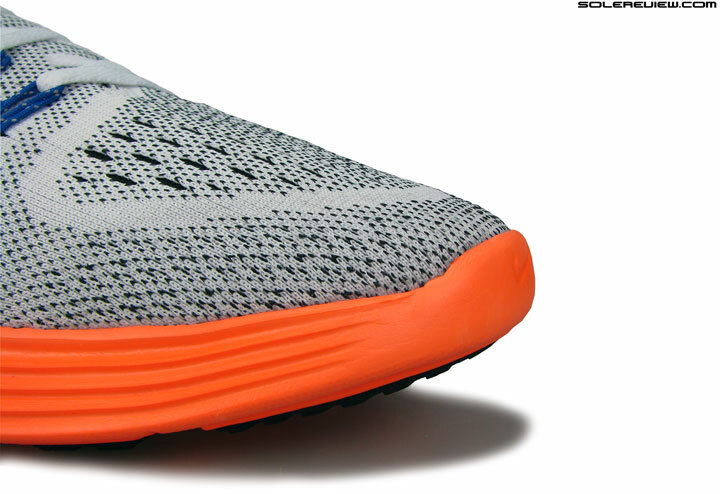 Has plenty of cushioning upfront, and will last more than the LunarTempo or Racer. Hey Solereview! I ordered a pair of the Lunartempos but I am slightly concerned about durability. Will they wear out abnormally fast or will that not be an issue? I was also wondering how the durability of the Flyknit Lunar 3 as well. It really depends on the runner (weight, cadence, form), and where you’re running (surface/temperature). But if we had to put a number, the LT’s outsole should be around 30% lower than regular shoes with a full rubber outsole. Tried them on a store a couple of days ago and really liked the lightness and cushioning. But the toe box is really shallow (and I have slim feet) and when my toes lifted from the insole and touched the upper it felt a bit awkward…I only walked with them but that strange feeling in the toe box put me off so I ended up buying a pair of Vomero 10 (no issues here) with a very good discount! Still I would like to try some light Nike model…is the toe box on the Lunaracer 3 that shallow also??? I also tried the Flyknit Lunar 3 but wasn’t very convinced (found the upper in the Vomero to be much more comfortable). Pedro, the Flyknit Lunar 3 has a higher toe area than the Lunar Tempo, so not an issue. The Lunartempo 2 is out now. Hello. Are these shoes for road training?Every second day 10km? I am 1.74m 75kg. I’m thinking about nimbus 17,cumulus 17 or new balance. I have Adidas glide boost 7 one year now and i think boost sole get too soft from my first runs.Now i have put extra insole. But guys i have run too much in these shoes and if you seen them still are like new shoes. Very durable. Compared to the adidas Glide Boost, the outsole will not last as long. More like the occasional shoe for going fast than a daily trainer. We’ve heard that the New Balance fresh foam 1080 V6 is nice, but we have not tested them personally. I have run in 3 marathons with Lunarglide 4, inspire 10 and Lunarglide 6 since now. The last one was under 3 hours, but since then, November 2015, I was doing my tempo and intervals only in Boston Boost 5 which I like for their better grip. I don’t know if I can wear them on my next marathon since I am a mild overpronator and I like to run longer distances in a supportive shoe. I wore my BB5 even on a 1500 m indoor race and made 4:51 minutes with them, hence my need for a lighter shoe to cover shorter distances. 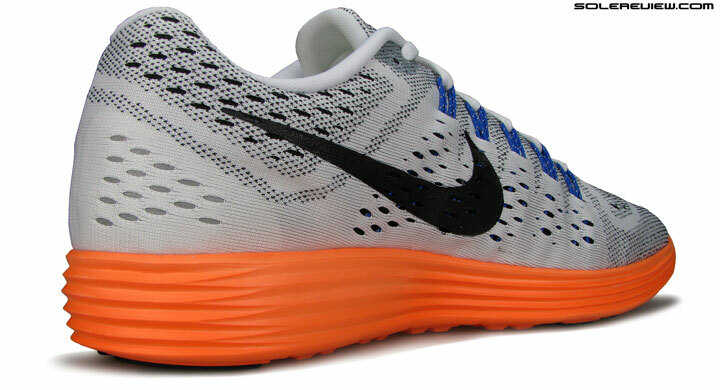 Do you think that lunartempo or lunarracer are a lot better shoes for speed work? What about cushioning? I was thinking to Saucony Faswitch 7 too, since they have a little support like NB 1500 v1 and a lower drop which can help me to correct my heel strike. The Boston Boost might be a bit too firm for a marathon, so why not try the adidas Glide 8 or 7 Boost? If you need more support, the Sequence Boost 7 and 8 are great shoes. As far as your need for a lighter shoe is concerned, we recommend the Lunaracer 3, which combines lightweight with enough cushioning. Don’t know the Fastwitch 7 rides, haven’t tested that one yet. And have you run in the 1500? Great shoe, that one. Can you compare this shoe to the vometo 10? Which is better for long distance running? Two very different shoes – you can long distance in both, bu you have to be more specific with regards to what you want your shoe to feel like.